ST. PETERSBURG, Florida- The Tyvek was torn, shredded and flapped forlornly in the breeze. An unfinished townhome community baked in the Florida sun when buyers canceled their purchase contracts in the global financial meltdown and the bank stopped funding. The developer saw a copy of Bison Tales and figured it was worth a shot. With the housing market taking a beating every day in the press and many lenders decreasing their exposure to for-sale residential housing it was no surprise to David Repka, Founder of Bison Financial Group, when he received the call from a local developer needing to replace their current lender. While the lender originally agreed to fund the land acquisition and construction costs, they were spooked at the thought of funding a for-sale property through completion with that market in such turmoil. 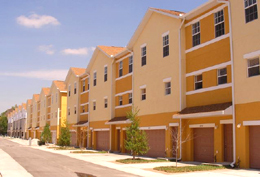 Since dirt was already flying and the developer was using his own resources to fund this 81-unit townhouse project located in Tampa, FL – time was of the essence to find a new lender. Bison was able to arrange a construction loan for $15,335,000 along with correspondent Doug Rozzell of Thomas D. Wood and Company from a regional bank. According to David Repka of Bison, “With the for-sale housing market in despair we needed to look at the project in another light. During talks with the developer we came to the conclusion that this project would be a fantastic location for off-campus student housing with its close proximity to USF and the University’s underserved student housing needs. Adjusting the economics of the project to a student housing complex with 311 beds allowed us to secure a lender and get the loan closed.” The loan consisted of two parts: a $3,000,000 revolving loan at a rate of LIBOR +300 basis points interest-only and a $12,335,000 non-revolving term facility with a rate of 6% and 25-year amortization on each building as it is stabilized. The loan-to-value is 75% and loan-to-cost is 80%. The Founders of Bison, David Repka and his brother, Jared, have built a reputation for closing complex real estate deals by being able to clearly define a borrowers needs and match them with the right lender to provide a positive outcome for all parties. Bison is an advisor to a network of local, regional, national and international real estate entrepreneurs that buy and develop properties in Florida and select markets nationwide. Bison funds development/ value-added properties and stabilized income producing properties.